Art #12 PVC lOCAL: 32 Panel Soccer Ball from locally made PVC material. Latex Bladder, laminated with 3-cotton layers and 1-polyester layers backing. Designed especially for promotion. Available in size 4 & 5. 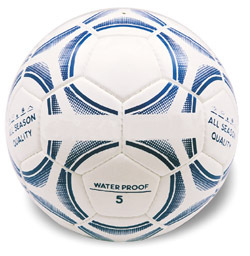 32 Panel Soccer Ball from locally made PVC material. Latex Bladder, laminated with 3-cotton layers and 1-polyester layers backing. Designed especially for promotion. Available in size 4 & 5.